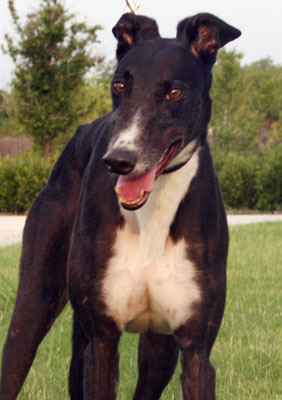 Crusher, aka Slatex Crusher, is a 5-year-old black male born October 19, 2008. His sire is Trent Lee and his dam is Just Dance. Crusher has 164 races on record at Greyhound-data.com. He started at the Victoryland track in Alabama on October 4, 2010. 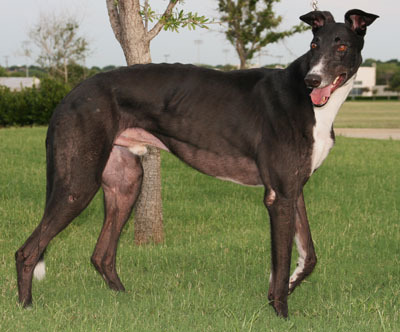 In mid 2011 he moved to Dubuque, Iowa until late 2011 when he moved to Gulf Greyhound Park in Texas. He raced there until June 27, 2013. Crusher is waiting for a foster home. Crusher should not live with cats. Crusher just turned 5! He is such a greyt hound! He does not have accidents in the house and loves to see what you are up to. Once he knows what you are doing he will either hang with you or go and lay down. He makes VERY short work of stuffie toys, so we're sticking to more durable playthings. For his birthday we got him a new ball that has quickly become his favorite. He will bounce, chase and chew on it. He loves other medium to large sized dogs. He is crated at night next to our other Greyhound and does greyt! He is quiet throughout the night and will even let you sleep in. He loves to run zoomies in the back yard in the morning and seems to really enjoy the cooler mornings lately. He also loves going on walks. He gets very excited when he hears the "W" word! Combine that with the leash and he’s ready and waiting at the front door. He is not fazed by his docked tail in the least…and all your drinks on the coffee table are safe from getting accidentally knocked over by an excited wag! He still wiggles the bit of tail that he does have like crazy when he's a happy boy, which is often. This sweet boy will crush your heart!